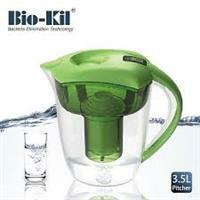 Sustainable Bio-kil Automatic Epidemic Technology was invented in 1996 by a multi-disciplinary team of professional R&D engineers from Cargico Corporation. It is an antimicrobial compound included with high surface area to maximize the efficient anti-microbial activity in contact with infected Water (or air) to be treated. The extensive test data specified most of the microbes such as MRSA, E. coli, Samonella, Legionella and a lot more, were well eliminated within a short time period. Sustainable Bio-kil system is safe and Sustainable Product which does not release any harmful chemicals into the water/air stream, nor pose any threat to health and the simplest eco design of this system requires minimal maintenance. Please use the Contact form on the right for Sustainable Bio-kil information and ordering. Your message will be sent to Betech (s'pore) Pte Ltd only. Privacy & Anti Spam protected.